Endoscopic sleeve gastroplasty is a non-surgical alternative to vertical sleeve gastrectomy. Like vertical sleeve gastrectomy, endoscopic sleeve gastroplasty leads to significant weight loss by reducing the size of the stomach from a football to that of a banana. The smaller stomach size limits how much you can eat, giving you the experience of feeling full sooner and for a longer period of time. Vertical sleeve gastrectomy achieves the smaller stomach size by surgically removing approximately 85 percent of the stomach. With endoscopic sleeve gastroplasty, however, the stomach size is reduced by placing sutures within the stomach and then pulling them tight to gather portions of the stomach together. Because the procedure is minimally invasive, both the risk of surgical complications and the recovery time are reduced. Unlike traditional bariatric surgery, which requires cutting through skin and tissue to alter or remove parts of the anatomy, no incisions are made during endoscopic sleeve gastroplasty. During this procedure, a flexible tube called an endoscope fitted with a mechanical suturing device is inserted through the mouth and threaded down the esophagus to the stomach, as seen above left. Once in the stomach, the suturing device sews three rows of stitches, as seen above right. The stitches are then pulled, constricting the pouch-like stomach into the shape of a sleeve. 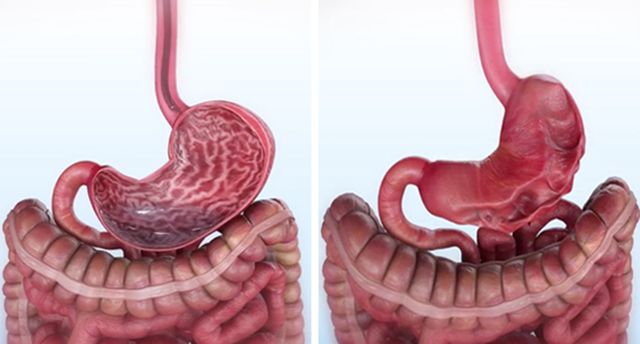 Above left, a normal stomach is shown; above right is a stomach after endoscopic sleeve gastroplasty. Questions? Call UCI Health Bariatric Surgery Services at 714-456-8063 to see if endoscopic sleeve gastroplasty is right for you.